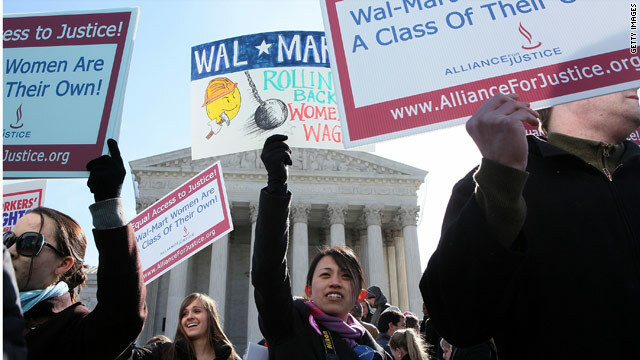 Activists supporting efforts to allow a class-action lawsuit against Wal-Mart hold signs in front of the Supreme Court on Tuesday. The Supreme Court's conservative majority didn't appear impressed Tuesday with plaintiffs' arguments that more than 1 million female Wal-Mart workers, past and present, should be able to accuse the retailer of discrimination in one class-action lawsuit, CNN senior legal analyst Jeffrey Toobin said. Though a ruling isn't expected until late June, the justices' reactions during oral arguments might portend a defeat for six plaintiffs who want to band with employees from across the country and make their accusations in a single, massive trial, Toobin said. "I thought it was a very good day in court for Wal-Mart, and I would not be at all surprised if the whole case were thrown out after listening to the justices today,” Toobin said on "CNN Newsroom." But the Supreme Court's conservative justices appeared skeptical of arguments for allowing a class action, Toobin said. "What the plaintiffs' lawyers were saying (Tuesday) was that that policy was so vague that it gave local, individual store managers the opportunity to discriminate against women," Toobin said. "The more conservative justices on the court were saying, 'Well, if that’s the case, how can you try them all together? Because each store had a different set of circumstances. How can you do a class action when the policy is a fair one, a good one, and it’s only the individuals who were possibly discriminated against?'" A decision to allow a class-action suit might lead Wal-Mart to try to settle the case to get the "enormous risk off its books," Toobin said. "But after today, I think Wal-Mart will be a lot less willing to settle, because it looks like much or all of the case may be thrown out by what is an increasingly conservative Supreme Court," Toobin said. - CNN Supreme Court Producer Bill Mears and CNN's Randi Kaye contributed to this report. @Scottish: You've been on here ALL day. Hahahahaha.... If I was your manager I'd treat you like the lazy troll you are too. In restaurants there are no women cooks/chefs (rarely) because that job is labor intensive and nasty, so women wait on tables which is still hard work, but nowhere near as demanding physically, then they complain they are not paid more than men. When I waited on tables all the girls who were buddies got the good sections because they were in the club, so I started cooking. When I did construction the only jobs girls would do is direct traffic for daddy's company. They never bother to learn heavy equipment operation or anything. Men will always make more as long as that trend continues. In America, only corporations have rights. There are better choice's when it comes to box store shopping. Here in Northern CA there are better options when it comes to grocery shopping. Then for clothing and other items one has to look at the Target stores. I like WINCO which is a family run and employee run company. I can do without the Walmart shopping experience. They are bad for communities and crush small businesses to death. Just my opinion. Are small businesses open 24 x 7? No. Are small businesses open on Sunday? No. Do small businesses sell stuff made in China? Yes. Does small business sell stuff cheaper? No. Do small businesses offer everything needed including groceries? No. Should small business people quit whining? Yes. Target is easy to shop due to there is no customers thus no waiting at the checkout! How in the heck does that company make a profit? Lets face it, Walmart has products that are cheap. In today's economy, people who would otherwise be happy to shop at stores other than Walmart are forced to re-think their choices because of their economic situation. So again the rich conservative fat-cats win at the expense of the poor and middle class. Hopefully those same people will be standing in line to vote at the next election. That is their only hope.